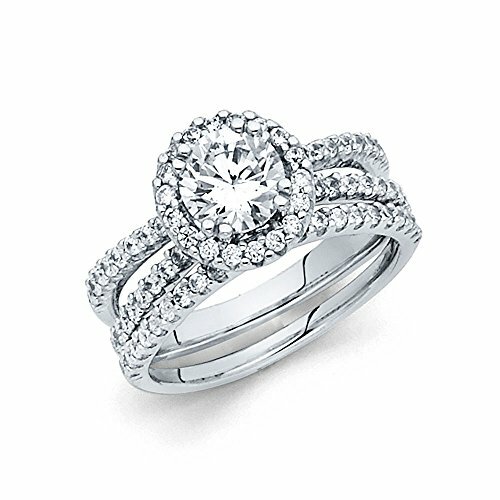 14K Solid White Gold 1.25 cttw Polished Halo Cubic Zirconia Engagement Wedding Ring, Size 7.5. Naturally Formed Cubic Zirocinia with Guaranteed 14K Solid White Gold; Authenticated with a 14K Stamp. Product Enclosed in Black Velvet Gift Box. US Size 7.5 (Available in US Sizes 4 to 9.5). Ships Same Day if Order Received by 2:00 PM Central USA; Free USPS First Class Shipping Includes Tracking. 30-Day, Hassle-Free, Full Money Back Guarantee; Contact Us to Process a Return and Receive a Pre-paid USPS Label with Tracking. If you have any questions about this product by Paradise Jewelers, contact us by completing and submitting the form below. If you are looking for a specif part number, please include it with your message.